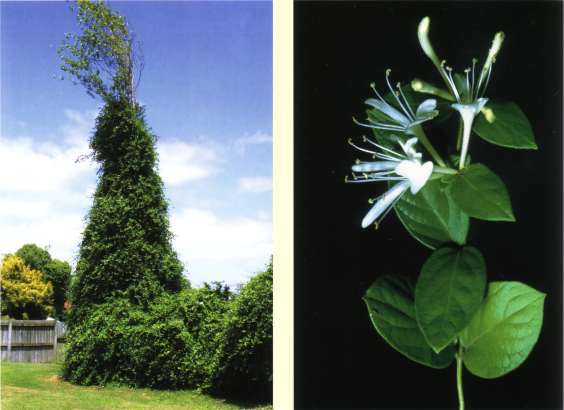 Sweet-scented, evergreen (semi-evergreen in cold districts), woody, rampant perennial climber twining clockwise, smothering all vegetation beneath. Very attractive, sweetly-scented, tubular white flowers. Oval leaves in opposite pairs. Flowers White, ageing to yellow, tinged pink, tubular, two-lipped flowers about 4 cm long. Usually in pairs in the leaf axils. Flowers very sweet-scented. Flowers Sep-May. Fruit Glossy-black, egg-shaped berries 5-7 mm in diameter. Seeds about 2 mm in diameter. Leaves In opposite pairs, short-stalked or stalkless. Early spring-produced leaves are waved or lobed, summer leaves are entire, oval up to 12 cm long by 6 cm wide. Stems Purplish, hairy, very long, tough, wiry. Fences, hedges, trees, banks, forest margins and clearings. 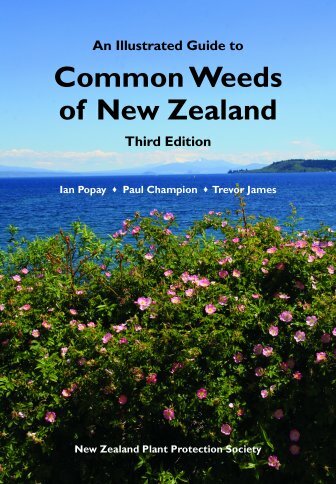 Common to abundant throughout NI, especially in Auckland Province; less common and decreasing southwards in SI. Originally from east Asia. Very attractive climber when flowering. Originally an escape from cultivation. Listed on the National Pest Plant Accord (see Introduction for details). Lonicera after Adam Lonitzer, 16th cent. German botanist; japonica (Lat.) = Japanese.